When the New Order first arrived, we promised to help everyone in highsec realize their full potential. Four million MinerBumping hits later, we're still keeping that promise--in ways no one could have dreamed. 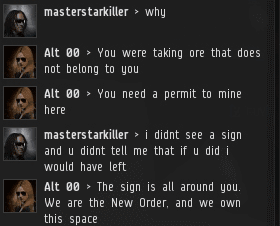 Consider Alt 00, who rose from her humble origins to reach the pinnacle of elite PvP in EVE: becoming an official Agent of the New Order. The Code made this possible. When Alt 00 met him, masterstarkiller was your typical Goofus, lazily piloting a Retriever while AFK. He did everything halfway, if he did it at all. Alt 00 woke him up with a gank. When masterstarkiller returned to his keyboard, he was horrified to discover his Retriever was missing. Sometimes you don't appreciate what you've got until it's gone. masterstarkiller's death was not in vain. Our Agent used him as an example to teach the other miners in Jaschercis local. She could only pray they'd listen. 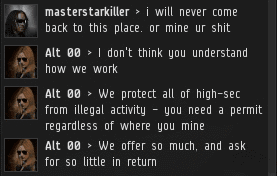 The pushy miner hadn't gotten a response to his EVEmail yet, so he rudely butted his way into the ongoing chat in local. Alt 00 received him graciously. A wicked and bot-aspirant generation of carebears demands a sign. But they were already sent the Code. For no apparent reason, masterstarkiller felt entitled to a full refund of his 36.4 million isk ship. 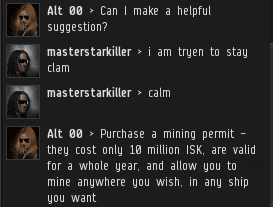 He took the liberty of rounding up to 40 million isk. Hey, why not? He'd earned it, right? In fact, the miner was indebted to Alt 00. 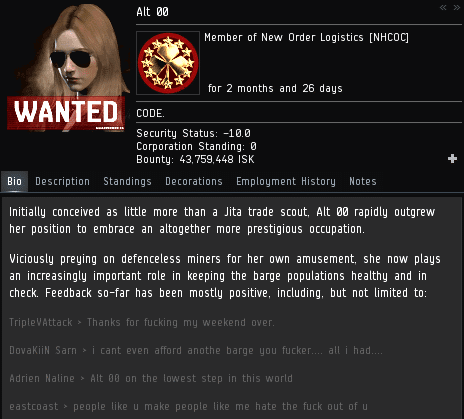 He owed her 10 million isk for a permit, plus a "GF" or equivalent congratulations for her PvP victory. And he was flirting dangerously with a Red Pen fee. 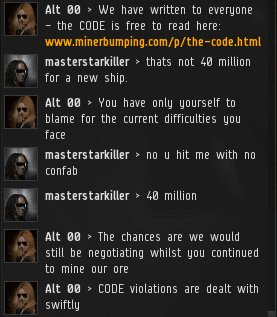 The miner rejected our priceless Code in favor of 40 million isk. It was as if he only cared about money. If this is what new players have to offer our community, I don't know why we all care so much about retaining them. It was then that masterstarkiller learned he was dreadfully mistaken about the nature of highsec. It wasn't only the Jaschercis system that was governed by the Code. He would need to rethink everything he thought he knew about EVE. Even though he was explicitly instructed to calm down by a duly authorized Agent of the New Order, masterstarkiller was heading in the opposite direction. It was time for Alt 00 to put a stop to this unseemly display. There it was, a perfectly reasonable solution to all of masterstarkiller's problems. He didn't need to go any further down the road to a meltdown in local. If he chose the Code now, everything would be fine. But if he rejected the Code, the situation could get ugly. 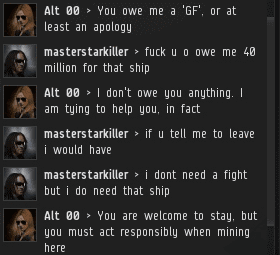 Wonderfully handled by Agent Alt 00, former 'Jita Trade Scout'. Those carebear names (like masterstarkiller) get me every time. I wonder if people create those characters intending to become powerful pvpers, then get sucked into bot-aspirancy and abandon their dreams, or if they just set them up as a joke, not having any grand plans to begin with. Congratulations, Saviour, on the 4,000,000+ pageviews; give yourself a pat on the back - you earned it! "When masterstarkiller returned to his keyboard, he was horrified to discover his Retriever was missing. Sometimes you don't appreciate what you've got until it's gone." "A wicked and bot-aspirant generation of carebears demands a sign. But they were already sent the Code." The "Miner goal" anchored cans? Very fondly remembered. Heh. I forgot about those. I haven't thought about the old mass bump fleets in a long while. Those were good fun. Oh the rage that simple bumping used to generate when we were new on the scene. Great job Alt 00! Keep up the good work! 4 million views! Wooo! Hey Supreme Protector, your awesome is showing! "In any ship you want"
That's not quite correct right? It can't be fail-fit even with a permit I thought. Yet again, CODE fails to see the obvious. Is CODE's delusional founder somehow spreading his delusion amongst his lackey's? Or is it simply a self-preservation tactic to be used when surround by heavily armed psychopaths? CODE is not 'Elite PvP', nor does it warrant a 'GF'. 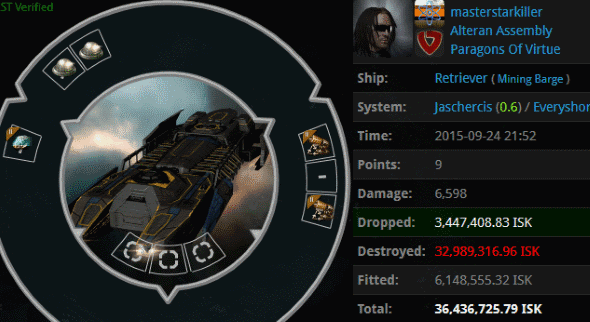 CODE are opportunistic pirates that gank poorly fitted ships flown by idiots and morons. Literally anyone can kill those targets. There is no risk, there is no challenge, there is nothing that makes it 'Elite' in anyway. Shooting ships that are generally unarmed, almost universally poorly fit, and flown by pilots that have no idea what they are doing isn't a fight, its target practice. Do you expect your paper targets to thank you for blowing them into confetti after you're done at the range? Be proud of what you are, but don't pretend you are more then what you are. That way lies hubris, folly, and failure. If you want 'Elite PvP' there are places to get that. 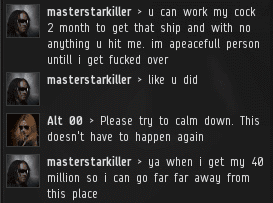 Shooting idiots in untanked, unarmed, ships in high-sec isn't the correct place. 'gf' is a saying similar to 'gg' in other games, used at the end of any confrontation, regardless of whether anyone considers it a good fight or not, or whether both sides were able to shoot, or even whether any ships were destroyed as a result. Further, the vast majority of barges are, in fact, armed. With combat drones. Logistics ships in fleet engagements often don't even have that, and yet nobody is against shooting those. Sure, logis usually have a fleet of other combat ships to go with them, but I'm sure you'll agree that CONCORD outguns any player fleet by a large margin. However, your main mistake is in the last paragraph. 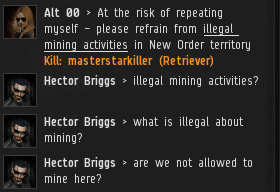 There are no places dedicated to elite pvp in eve, just as there are no places dedicated to industry and afk mining. We, the players, have to create those places for ourselves, and that is exactly what the New Order does in Highsec. I think the main problem with people who try to criticize the New Order's pvp prowess is their own lack of experience with what is largely perceived as "real pvp" by the majority, or their inability to comprehend how those fights work. Because as someone who does both on a near-daily basis I can confirm that there is, indeed, no mechanical difference whatsoever. What is different is that the New Order has a goal, and it is not a monetary one. It is a higher purpose so grand and beautiful that even conquering the entirety of Highsec space is merely the first step. The code.. lol. Don't they roam high sec level 4 space too and try to gank level 4 runners?